You are here: Home / Daily Journal / November 4: Back home! This morning I wore a newly purchased outfit and finished up our meeting. I had to leave a bit early to catch my flight home, but I made a point to personally say goodbye to each of the clients that I met on this trip. All in all, it was a good trip. I had time to myself to relax and soak in life. I also had a good time with the meetings and things were relatively interesting. I had amazing food and even came home with jackets and trousers to round out my wardrobe. I missed my children but I knew I would have some extra time with them today since I took an earlier flight back. I met my dad at home and walked into a house that smelled of a roast cooking. Together we walked to pick up the Twins. It was so sweet reuniting with them. Twin Crazy was jumping up and down and jumping on me and throwing her arms around my neck. Twin Husky was excited, but he was playing “cool”. My dad was with us so they also thought that was interesting. They are not used to being picked up early. Twin Crazy was busy scaling up the stroller to get in – Twin Husky was hesitant – it seemed like he wanted to stay there and play a bit. I feel like both have changed somewhat in the 3 days I’ve been away. Twin Husky looks bigger to me. Twin Crazy seems more expressive. 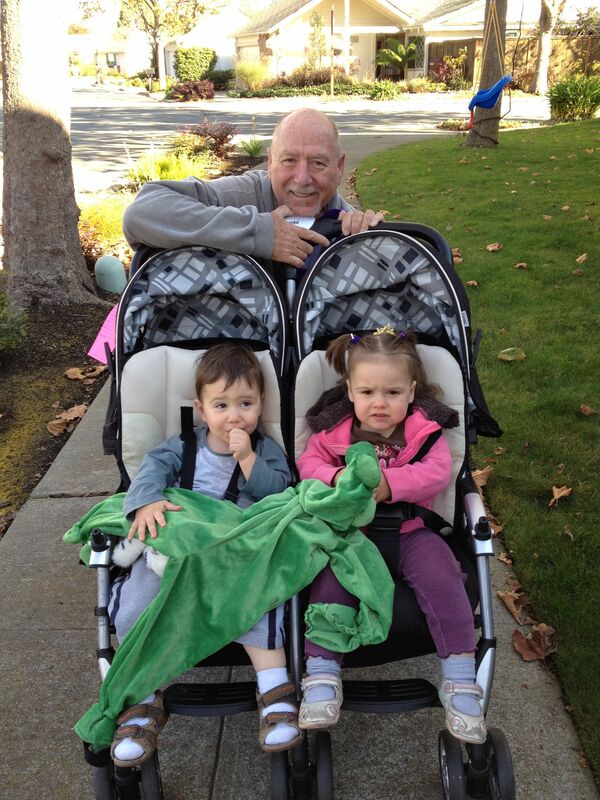 Both are adorable and my dad (a Twin himself) is so proud to be the grandfather of twins. We then went to pick up Big Bro. He was happy to see Pop Pop and also happy to hear that his new bike lock came in the mail. We all walked home together. He held my hand and talked about the past few days to fill me in on what I missed. Apparently Twin Crazy unwrapped a lollipop and ate it. So cute. It was a beautiful day. We passed a playground but Big Bro wanted to get home quickly instead. Pop pop stayed back with the kids while I picked up Red. Her face was beaming. I love that child to pieces. We walked in and she immediately ran to Pop pop. He has a way with her. They are always goofy together. We had a great dinner, then all sat down to Shrek and some popcorn. The kids are all in bed now — I think sufficiently exhausted. I think my dad’s exhausted too. We’re going to sit back and relax for a bit now and will likely call it a night early. My dad only has tomorrow and will leave very early on Sunday morning. We will be with Big Bro and Red, while Hubby heads to his folks’ place with the Twins. I’m not sure what we’ll do tomorrow, but I bet there will be some time devoted to Big Bro’s bike and his new bike lock. « November 3: Managing just fine being away, sometimes, well… not really.